Dr. Graham has written numerous books, many of which are used in university classrooms across the United States. His latest book LEAD: How Effective Leaders Get Things Done is a culmination of his leadership experience and the interactions he has had with the dozens of businesses that he consults with every year. If you have been a participant in one of Dr. Graham’s sessions, you can attest to his relaxed, and common sense style of understanding the dynamics of leadership. His insightful commentary and thorough case studies make his classes some of the most popular classes CMD offers. His Leadership Elite series, which is 8 weeks with Dr. Graham, is packed with nuggets that are applicable in any industry for any leader. Beside carrying a full class load for the University, and teaching for the Center for Management Development in the classroom, Dr. Graham also teaches on-line Leadership sessions. You can get two of his leadership sessions online, which is basically one-on-one with Dr. Graham. Those sessions are Strategic Negotiations and Essential Skills for Effective Leaders. 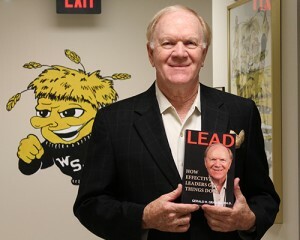 His latest book, LEAD: How Effective Leaders Get Things Done is sold exclusively through the Center for Management Development. If you bring it to the classroom with you, he will autograph it for you!